Finally, I can talk about our newest release! 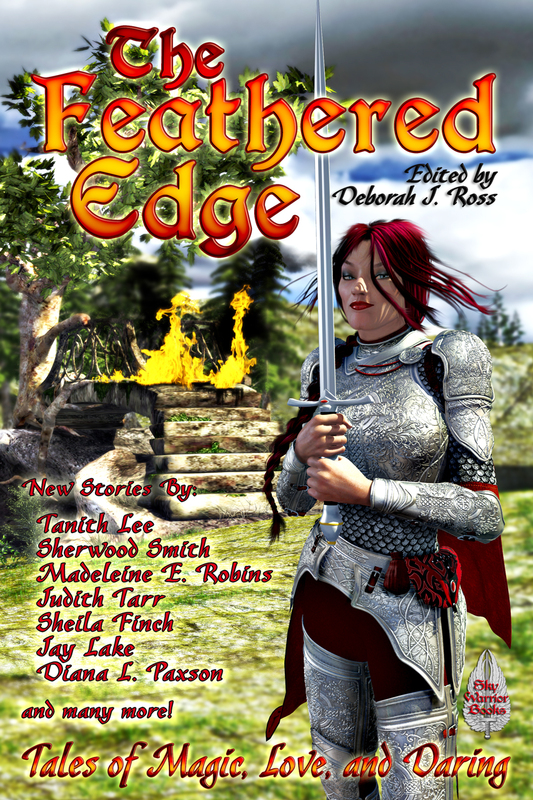 We have just released the e-book version of The Feathered Edge: Tales of Magic, Love, and Daring edited by Deborah J. Ross with new, never before published works by Tanith Lee, Sherwood Smith, Kari Sperring, Madeleine E. Robins, Judith Tarr, Sheila Finch, Jay Lake, and other equally talented fantasy authors. This is a fabulous collection of fantasy swashbuckling short stories. Want a taste of romance in your swashbuckling adventure? Sparkling verbal repartee in your heroic quest? A lover swain spun of dreams and moonlight? A rescue from an Algerian brothel? Swords that would rather make love than fight duels? A woodland god in the guise of a wounded stag? A stowaway on a pirate ship? Between waking and dreams, 'twixt mortal lands and Faerie, the old world and the new, lies an enchanted realm. Here lovers duel with wits as well as swords, swords have souls, and swordsmen rouse from their garden graves. Master storytellers offer a sumptuous feast of lovers and rivals, ghosts and paladins, danger and daring, wit and wizardry, for your reading delight. It's a fun romp. You can buy it from Amazon.com , BN.com or Smashwords for just $3.99. It's a great book that you'll enjoy reading again and again. Book Giveaways a GREAT Success! Hey, folks! Thanks for making our giveaways a huge success! We hit #3 on the Kindle Bestsellers List for Genre Anthologies on Zombiefied and Michael J. Parry's The Spiral Tattoo hit number #77 on the Hard-boiled bestseller lists for The Spiral Tattoo. Wow! Thank you so much! Enjoy the books--I know you will. If you like these books, check out our other books at www.skywarriorbooks.com Many of the authors featured in Zombiefied are published in our line. If you missed our giveaways, which some of you did, you can still purchase Zombiefied! 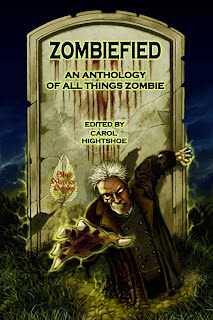 An Anthology of All Things Zombie and The Spiral Tattoo through Amazon for the low price of $2.99. One more thing: if you enjoyed the books, feel free to "like" it on the Amazon homepage, add your own tags, and even write a review. Again, thanks so much. You guys are the best! Today is Z-Day at Sky Warrior Books! Just when you thought you couldn't get another free book on us, we're giving away a book that groans, shambles and eats brains! Get ZOMBIEFIED at Amazon for the low price of FREE. That's right, FREE. But today only, Pacific Standard Time. You'll get some of the funniest, scariest, and just plain weirdest stories about zombies that you can't read just anywhere. We've got stories by Dayton Ward, Gary Jonas, John Lance, M.H. Bonham, David Lee Summers, Carol Hightshoe, and other exceedingly warp individuals that are sure to make you groan and shamble. We've got stories about zombie politicians, zombie rescuers, zombie soldiers, zombie call center workers, zombie bowlers and zombie prom dates. Heck, if you don't get this book, your brain will rot! Get ZOMBIEFIED, FREE at AMAZON.COM, January 27th only! Friday the 13th is Lucky at Sky Warrior Books! Friday the 13th is considered bad luck, but you're unbelievably lucky this Friday, January 13th. For one day, Sky Warrior Books is giving away Michael Parry's novel, The Spiral Tattoo , on Amazon! This is a great opportunity to read some of Michael J. Parry's amazing work and get acquainted with one of our books. "Law comes in two sizes: six inches and eight feet. Elanore, the eight-foot tall troll, and Gurt, the six-inch tall (don't you dare call me a fairy) Eleinu, both guardsmen in the city of Delvenport, tackle their most baffling case yet. When they find a dead waitress, naked except for an intricate tattoo in a spiral across her body, they're launched into an adventure in the seedier side of Delvenport, filled with rogue mages, prostitution, and narcotics. But can they solve the case before madness and riots take over the city?" Get your FREE copy on Amazon.com this Friday, January 13th! I hope everyone has had a good holidays and a safe and happy new year. Tonight I figured I should tell you what new releases are coming up for Sky Warrior Books. Sky Warrior Books welcomes John Dalmas to our list of authors! We'll be reprinting John's amazing work, The Second Coming. We're planning on other books by him, so check out our blog for more news. 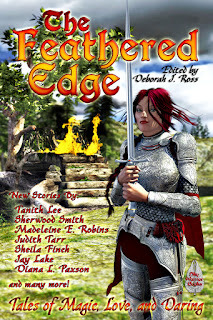 The Feathered Edge, edited by Deborah J. Ross, is an anthology of swashbuckling and romance, guaranteed to delight fans with new works by Kari Sperring, Tanith Lee, Sherwood Smith, Diane E. Paxton, Judith Tarr, K.D. Wentworth, David Smeds, among other very amazing authors. Should be out early this year! 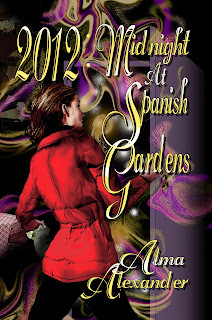 World bestselling author, Alma Alexander's book, 2012: Midnight at Spanish Gardens , is now available in print on Amazon for $16.95! Speaking of Alma, I'm editing Embers of Heaven, the sequel to the international bestseller, The Secrets of Jin-Shei. It should be out early this year. 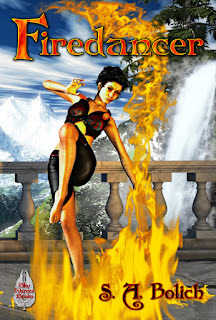 S.A. Bolich has done it again with her sequel to her popular Firedancer . Windrider will be coming out this Spring. Gary Jonas follows up his bestselling novel, Modern Sorcery , with Acheron Highway, another Jonathan Shade novel. He and Brand Whitlock are working on a Graphic Novel of the Hitman, so keep an eye out for that. I'll toot my own horn and mention that my own book, Prophecy of Swords , hit the Amazon bestseller lists again for fantasy, selling more than 500 copies in one day. By the time I noticed it, it was down to the top 20th book in fantasy. Pays for me to look at my own books, eh? We've got some interesting books by Pat MacEwen coming out. One, Rough Magic, is an urban fantasy and mystery where the realm of Faerie and our own world collided to make a difficult world for those who cannot abide cold iron. The Dragon's Kiss is a YA book about a handicap child who wishes to become a dragon rider. Great stuff! We've also signed on Deby Fredricks with her fantasy, The Seven Exalted Orders. Look for it this summer. Michael Parry's Gurt and Eleanor, will return with the mystery, The Oak Grove. We'll be having two more anthologies out in the Spring, Gears and Levers, a Steampunk Anthology edited by Phyllis Irene Radford, and The Mystical Cat, edited by Dusty Rainbolt. That's all I can talk about at present, but I'll continue to make announcements as they come up!